Bulgaria, so mysterious to most Americans, has a vivid identity as a crossroads of the Balkans. We'll trace the country's complex history, from ancient Thracian tombs to medieval Orthodox Christian monasteries to Soviet monuments. And we'll enjoy an intimate taste of contemporary culture: the yellow brick road of Sofia; the gregarious craftspeople of the medieval capital, Veliko Tarnovo; and the thriving pedestrian zones of cosmopolitan Plovdiv. Hi, I'm Rick Steves back with more of the best of Europe. This time I'm surrounded by Slavic culture…it's Bulgaria! Thanks for joining us. Relatively unknown and underappreciated, Bulgaria is a country I've long enjoyed for the surprises it offers the curious traveler. 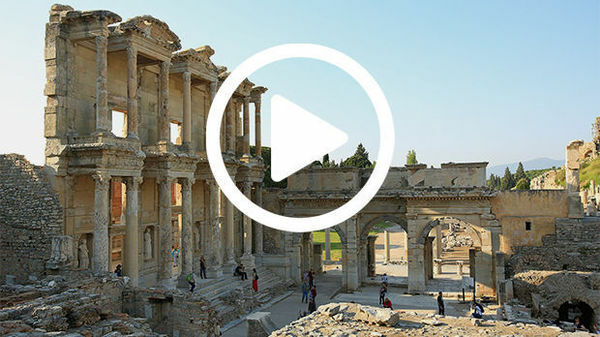 A crossroads of civilizations, it offers a fascinating story. In the southeast of Europe, Bulgaria sits at the east end of the Balkan Peninsula. From Sofia, we visit Rila Monastery, head north to Veliko Tarnovo, explore the Thracian Plain, and finish in Plovdiv. Sofia may be the capital of one of the poorest countries in the European Union, but you wouldn't know it strolling its vibrant boulevards. With a million people, Sofia is delightfully livable. It has an airy, open street plan, fine old architecture, lush parks, and a relaxed pace of life. The city is named for "holy wisdom," represented by this statue of Sveta Sofia. She proudly tops a column marking the center of town. Because of its strategic position, Bulgaria sits on layers of history. From ancient Greeks and Romans to fearsome Slavic warriors, from Ottoman pashas to Cold War communists, each left its mark. In this town, anywhere you dig, you find ancient ruins — bits of Roman Sofia. Preserving its rich heritage is a priority, and the city's infrastructure is built around its archeological treasures. Every day commuters walk by reminders of Sofia's distant past. Bulgaria's complicated history has made it a melting pot. And with its ethnic diversity came different religions. Here in Sofia, within a few steps, you've got mosques, churches, and a synagogue. Most Bulgarians — like Russians and Greeks — are Orthodox Christians, and the Orthodox tradition stretches from here far to the East. And this mosque survives from five centuries of Ottoman rule. Today, one in every 10 Bulgarian citizens is Muslim, whose ancestors came from Turkey. A block away is one of Europe's largest synagogues. Bulgaria was one of the only countries in Nazi territory that refused to turn its Jewish population over to Hitler. None of Bulgaria's 49,000 Jews were deported to concentration camps. I'm joined by my Bulgarian friend and fellow tour guide, Stefan Bozadzhiev, who's my teacher for all things Bulgarian — including some fun little insights. Rick: How many springs in Sofia like this? Stefan: We have more than 40, and this is just one of them. Rick: And the people, why do they like this so much? Stefan: Because they'll have eternal life if they drink it! Rick: So this is healthy water, then. Stefan: Very healthy. Try it! Stefan: Yes, a little bit sulfur, probably. Rick: I'm feeling better already. Stefan: And I see it in your eyes! Sofia prides itself on its mineral springs, which attracted the first settlers here in ancient times. And to this day, these perpetually flowing water taps are appreciated by the locals. And the city even has an actual yellow-brick road. These bricks were a gift from Austria's Emperor Franz Josef — who, after what must have been a muddy visit in 1907, wanted to encourage Sofia to pave its streets. The bricks lead to Sofia's cathedral — one of the largest Orthodox churches in Christendom. It's the only national church I can think of that's named for a sainted military hero of a different country: Alexander Nevsky, of Russia. The Bulgarians feel a Slavic kinship with Russia — which, in 1878, helped liberate them from centuries of Ottoman rule. This church was built to honor the Russian soldiers who died to free Bulgaria from the so-called "Turkish yoke." Russian architects designed the church with a mix of Russian and Neo-Byzantine styles. Its cascading gold and copper domes are striking from every angle. Inside, you're immersed in the glow of Orthodox tradition. Walls glitter with gold and silver icons, all from the early 20th century. Worshippers show their devotion with the help of sacred images. The elaborate marble iconostasis separates parishioners from the main altar. It's lined with saints, including the church's namesake, Alexander Nevsky. The faithful light candles to help power their prayers: lower-level candelabras are for the deceased; higher-level ones represent prayers for the living. Sofia has lots of sprawling parks, offering apartment dwellers a green and inviting space to hang out. And many of the parks come with heavy reminders of a tough 20th century. After World War II, Bulgaria ended up in the Soviet Bloc. Even though Bulgaria was famously docile under Russian rule, life under communism wasn't easy here. And today, while enthusiastically part of the EU, Bulgaria still wrestles with its communist legacy. All over Bulgaria, controversy swirls around crumbling communist-era monuments — like this one. Should they be allowed to stand, or should they be torn down? Many have already been removed and are displayed here at Sofia's Museum of Socialist Art. In this garden of communist propaganda, Lenin, who once topped the main pillar in the center of town, still faces the storm. The red star, which for 50 years capped the city's grandest edifice, no longer inspires. And Georgi Dimitrov, the "Bulgarian Lenin," is simply ignored. Today, these statues seem to preach their outdated ideology only to each other. We're driving deep into the mountains south of Sofia. The peaceful beech forests seem a world away from the big city. Finally, we reach Rila Monastery: fortress on the outside…spiritual sanctuary inside. Within its walls, you feel something special — both sacred and timeless. Founded in the 10th century, Rila Monastery was a stronghold for Bulgarian faith, language, and culture during nearly 500 years of Ottoman rule. And today, it remains the country's revered national treasure. This beautiful place has been a holy site and refuge for over a thousand years. The monastery is still home to a handful of monks, who host both tourists and pilgrims. This bell tower, the oldest surviving part of the monastery, served as a final refuge in case of attack. The iconic church is surrounded by a graceful arcade. Under the arcade, vivid 19th-century frescoes depict Bible stories, peopled by angels and devils, saints and sinners. Here's St. John of Rila, who, seeking a hermetic way of life, founded this remote monastery in the year 927. These scenes show the 40 days of trials your soul goes through after death. A guardian angel accompanies the soul — represented by a small child — through a gauntlet of temptations. Rick: This place feels so venerable. Did you come here as a child? Stefan: Yes — actually many times, with my family. It was a favorite destination. Rick: So, why is Rila so important to the Bulgarian people? Stefan: Because actually our most favorite, most beloved saint, Saint Ivan Rilski, was buried nearby. Rick: Ah, OK. So this is like the…you could say, the "Jerusalem" for the Bulgarian people. Stefan: Absolutely! The heart of every single Bulgarian belongs to this place, belongs to this monastery here. Rick: You come here and celebrate Bulgaria. Stefan: We celebrate Bulgaria, and the Bulgarian experience. Driving across Bulgaria, traffic is sparse, roads are good, and — since we're here in the spring — everything is green and fertile. Our next stop is Bulgaria's medieval capital, Veliko Tarnovo. One of Europe's most dramatically set cities, it winds through a misty gorge at a sharp bend of the Yantra River. The town is shaped like a natural amphitheater. It's more vertical than horizontal, with a mix of blocky modern construction and traditional Bulgarian homes. The ruins of its fortress are a reminder of the city's importance 800 years ago. They mark the site of the heavily fortified headquarters of a long-gone Bulgarian kingdom. This towering monument commemorates that vast and mighty realm. It was ruled by the Asen dynasty. According to legend, the Asen brothers planted a sword on this spot and said, "Here shall be Bulgaria." This was a golden age for Bulgaria — the 13th and 14th centuries — when its empire dominated the Balkan Peninsula, and stretched all the way to Ukraine. Today's locals have different aspirations. A walk along Veliko Tarnovo's craft street reveals a thriving folk culture with opportunities to watch artisans at work. Rumi carves with a keen eye. Rashko paints icons with a delicate touch. Nina skillfully turns clay into art. Meanwhile, her son finishes each piece with patterns that go back centuries. Todor the silversmith — with his strong hands and distinctive technique — transforms strips and strands of metal into exquisite jewelry. And, nearby, a folkloric dance troupe shares their traditional music. Leaving Veliko Tarnovo, we cross over the Balkan Mountains. At the top of Shipka Pass, a memorial marks the site where, in 1877, a combined Bulgarian and Russian army finally turned the tide in the battle against the Ottomans. This pivotal battle led to the eventual demise of the Ottoman Empire, and to the creation of the modern, independent country of Bulgaria. Down in the valley, golden domes mark Shipka Church, which honors the sacrifice of those Russian and Bulgarian troops. Built by Russia a century ago, it's a fine example of the exuberant "Muscovite" style. Capping a nearby ridge — miles from anything — is one of the most bizarre sights I've seen anywhere: Buzludzha, an abandoned monument to the Bulgarian Communist Party. This gigantic conference hall was built in the 1980s, in the waning days of communist rule. With the end of the Cold War and the arrival of capitalism, it was abandoned. Today, the lyrics of the international communist anthem are literally falling off the walls. And graffiti makes it clear who won the Cold War. Venturing inside, we discover an eerie, crumbling world of vandalized propaganda, a roof that's barely held up by its hammer and sickle, and disintegrating mosaics — once so proud, and now just an artifact of a failed system. The Thracian Plain, defined by Bulgaria's two major mountain ranges, was a busy funnel of trade throughout ancient times. Four centuries before Christ, back when Socrates and Plato were doing their thing in Athens — about 300 miles to the south — Bulgaria was known as "Thrace." The Thracians were an impressive civilization. We've learned a lot about them through their tombs. Thracians buried their royalty in distinctive, dome-shaped tombs that were covered in earth. Dozens of these tombs are scattered across this valley, along with hundreds of decoy mounds designed to fool grave robbers. Buried deep under those piles of earth, the tombs were impressive engineering feats from 300 years before Christ. And this replica tomb demonstrates how even in the afterlife, the deceased would be surrounded by comforting images. Rick: So what do we have? Stefan: We have the Thracian king, who is buried here. And the royal banquet, with the gods, musicians, servants, horses. And on the top of it we have races with chariots, which is a part of a funeral procession. Tombs held a trove of golden treasure, now displayed in museums throughout Bulgaria. This bronze head of a powerful king humanizes those ancient Thracians. This region is also called the "Valley of the Roses." And we're here just in time for the rose harvest. Vast fields of roses bloom overnight. Workers rise before the sun to quickly hand-pick the new blooms. They need to work early, before the rising sun evaporates the essential oils. While the fields smell sweet, the work is hard. At the distillery, millions of blooms are quickly unloaded. Freshness is critical. The bags of roses are stacked high before being dumped into the stills. So many flowers and so much hard work. The essential oils evaporate, then recondense...like fragrant moonshine. The payoff: a wide variety of rose oil products, appreciated both abroad, and at home. Kazanlak, the main town of the valley — is especially festive in May. And we happened to drop in on a national holiday. It's the Day of Slavic Culture. Throughout the country, school's out — and people are celebrating. Like much of the Slavic world, Bulgaria uses the Cyrillic alphabet. And today, flowers are laid at a monument to Cyril and Methodius, the missionary saints who invented the Cyrillic script to help introduce Christianity to the Slavs back in the ninth century. It's a great excuse for a parade — a celebration not only of their alphabet, but of the Bulgarian language and culture in general. And it seems the entire town has turned out for the event. Our final stop is Bulgaria's most enjoyable city, Plovdiv — with a history going back centuries before Christ. From its ruined acropolis, it's easy to see the hills upon which ancient Plovdiv was built. In the fourth century B.C., it was called Philippopolis…the "City of Philip" — he was the father of Alexander the Great. Centuries later, the Roman Emperor Trajan built this 5,000-seat theater. The stage wall is mostly intact. The stony seats are etched with their original numbers. And the theater remains part of the community to this day. On the surrounding hillsides, Plovdiv's atmospheric Old Town is a showcase of delightful buildings from the 1800s — a time when the ruling Ottoman Empire was in decline, and Bulgarian cultural pride was on the rise. The style: "Bulgarian National Revival." One of the finest examples is open to the public. Hindliyan House was decorated to the taste of its merchant owner. Elegant in its day, it still feels lived-in, with opulent sitting rooms, fine furnishings, even a rose water fountain. Souvenir wall paintings show off some of the merchant's far-flung business travels, from Stockholm to Venice. Nearby is a museum celebrating the work of the Bulgarian artist Zlatyu Boyadzhiev. Boyadzhiev — this is a self-portrait, with his wife — was already a well-established artist when his health took a terrible turn. In 1951, he suffered a stroke, which made his right hand useless. But that didn't stop him. He picked up the brush in his left hand and learned to paint brilliantly — in a completely different style. Over the next 25 years, he reveled in bright colors with a childlike exuberance, slapping thick, Van Gogh–like brushstrokes onto the canvas. Boyadzhiev's best works feature timeless slices of peasant life: Back in pagan times, people prayed not in temples, but under trees. Locals sit around a public fountain sipping glasses of wine. Peasant women cluster around a fire, knitting as they eke out warmth. A fattened pig is slaughtered as townsfolk gather. The importance of community is celebrated — and each weathered face tells a story. It's dinnertime, and Stefan's taking us out for a meal of updated Bulgarian classics. Prices are low here, making even a splurge like this surprisingly affordable. Rick: So what is this drink then? Stefan: This is a traditional Bulgarian drink, and it is called "rakia." Rick: So it's unusual for me to have the firewater with the salad. Is that typical in Bulgaria? Rick: To your health — nazdráve! Rick: And what is "no"? Rick: So, "no" [nods]…"yes" [shakes head] — yes? Rick: OK. Stefan, can I have another sip of my rakia please? As the second course arrives it's clear that Bulgarian cuisine is a tasty mix of the many cultures that have influenced this country. Rick: You know, frankly, this is more interesting than what I would expect. You go to "Eastern Europe," you think of potatoes, kraut, and heavy meat, but this is — it feels more Mediterranean. Stefan: Yes, actually — you're right. Bulgarian is a cross of all civilizations — between north and south, east and west. Rick: You got Mediterranean — so it's a little bit of Greece, a little bit of Turkey, and a lot of Bulgaria. Stefan: And a lot of Bulgaria. While most tourists stick to the cobbled old town, modern Plovdiv has plenty to offer as well. Just steps away is the vibrant and fun-loving corner of town called the "Mousetrap." Newly revitalized, this artsy district is where foodies and creative young people congregate. Thanks to some progressive policies, the graffiti in this neighborhood seems to add to, rather than detract from, the ambience. In Plovdiv, as in many European cities, local leaders understand that buildings are going to be tagged anyway. Their pragmatic solution? Commission only the best street artists to create art, rather than eyesores. Plovdiv is a city with many personalities, built upon layers of history: Under the 14th-century Ottoman mosque, they've excavated an ancient stadium. And these ruins have been artfully integrated into 21st-century life. They kick off Plovdiv's liveliest pedestrian boulevard, where people promenade in style — past inviting parks and sidewalk cafés. At this crossroads of civilizations, today's Bulgarians have blended old and new into a culture distinctly their own. Bulgaria is a great place to travel. A place where East and West mix harmoniously. The result: a land that's both exotic and fun to visit. Thanks for joining us. I'm Rick Steves. Until next time, keep on travelin'.